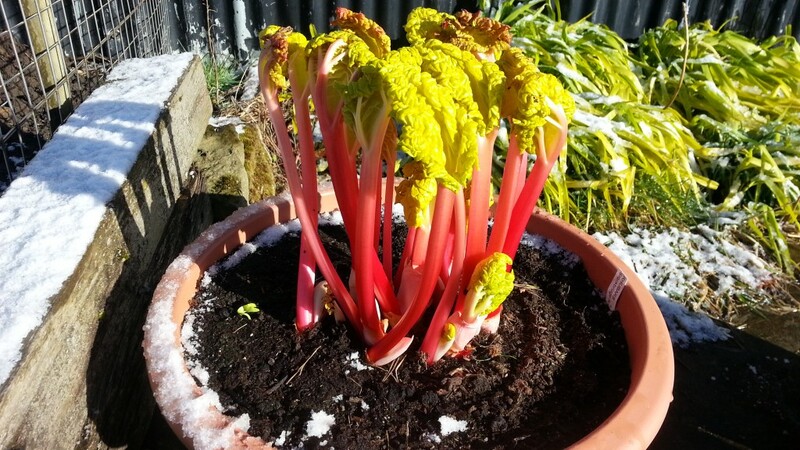 After my efforts back in February with forcing rhubarb it is very pleasing to report that both varieties have yielded a small crop. As both these plants are only just into their second year I didn’t want to push my luck but I did want to get some to try so that we will know what to expect in the future. The Champagne variety was the first to reach to top of the covering pot so that got eaten first, mostly in the form of Rhubarb Scones. The Stockbridge Arrow variety wasn’t too far behind though and luckily the covering pot helped to protect it when we received a light dusting of snow recently. I’ll leave the plants uncovered now and give a layer of mulch around the top of the pots to give them some more nutrients. Eventually they will be planted out into a dedicated bed along with the existing rhubarb plant which has been brought under control ready for later in the spring. I think my remaining rhubarb worry now is whether to work on improving the rhubarb scone recipe or perhaps I should have a go at making rhubarb crumble? Either way it’s a delicious choice to be faced with! I used the recipe here – http://thegardendeli.wordpress.com/2013/05/07/rhubarb-lemon-scones/ – but I didn’t have any lemon so I skipped that bit … nor any nutmeg either … apart from that I followed the recipe though!